Unagi (eel) is a great way for non-fish eaters to make the transition to trying fish. It is eaten cooked and usually teriyaki flavored, and has a subtle fish flavor. This is one of the more traditional rolls that can be found in most sushi restaurants. Unagi can be found frozen at Japanese supermarkets. Roll the sushi, using cucumber and unagi as your fillings. 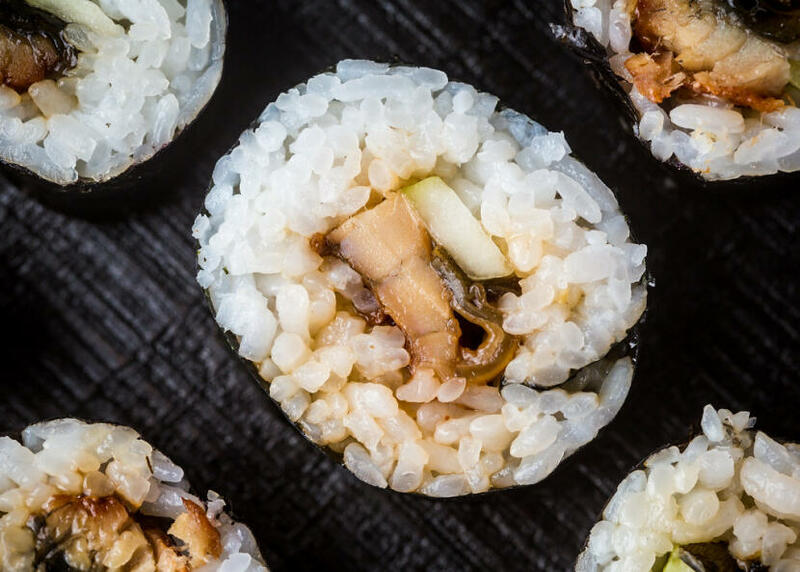 Unagi is an awesome sushi ingredient, especially when warm! 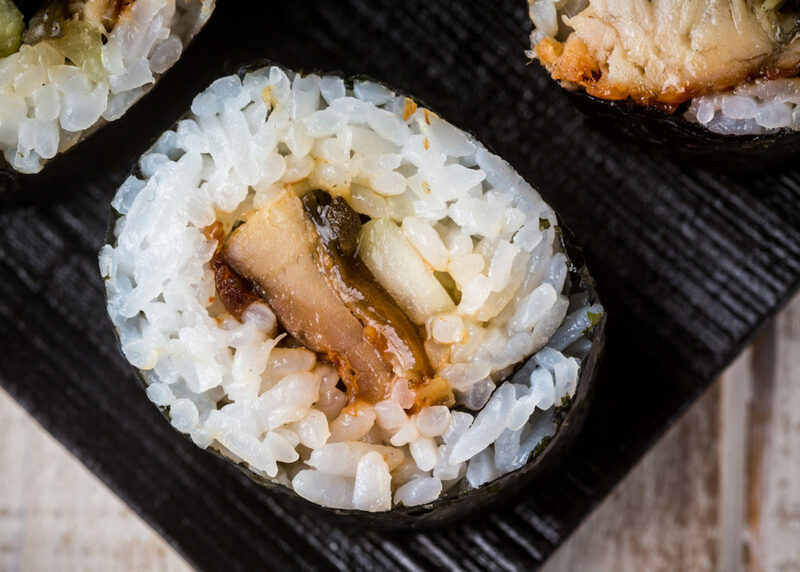 Unagi with tamago is a classic if you haven’t tried it already, and try a roll with unagi and cream cheese for melt-in-your-mouth happiness. Yum! you should heat up (oven toasted) the eel before you roll , and add a little eel sauce (kabayaki) on the roll before serving. 😛 also it’s better rice outside with sesame seed. Unagidon is another great one u should feature. Basicly, it’s a bed of rice and eel on top. ohhh yeahhhhh!! hien – I did heat it up, but thanks for the idea for the eel sauce! I have an inside-out roll similar to this coming soon, so stay tuned! 🙂 Unagidon sounds REALLY good! I’ll try that next time I gett unagi! Yvo – Hehe eel is so yummy! I used to be like that – we never had much fish when I was growing up (my mom LOVES sashimi but she is allergic to fish! 🙁 ) so I didn’t really like fish that much for a while. I tried eel a couple of years ago and it really grew on me! Nowadays I have been trying more types of fish, so although I’m not exactly a fish connoisseur, there definitely will be fish up here in the future! I first tried grilled eel for sushi a few months ago. I have been ruined for life. Tastiest thing ever. So use it! I just wanted to say that this is a wonderful site! Came across it while lookin for sushi recipes. Can any one tell me where to buy non-chinese-made kabayaki? I must admit that I would be happy to try the grilled eel but raw sushi just does not work for me, the annoying thing is it is always so well presented and looks mouthwatering. Also the descriptions are always so colourful and tantilizing, make me hungry right now just thinking about it..
My husband loves these, they are his his favorite food. When he orders them, he gets this molasses sauce on top, do you know or have any advice on that? That’s probably eel sauce (click on the link, and there’s a recipe for it 🙂 ). hello I rahmad.saya from Indonesia. I want to offer fish unagi? May I have your email? thank you before. I live in San Francisco, where is the best place to buy all these ingredients? For example fresh Tuna or frozen Unagi. Would I be able to find all that in Chinatown?